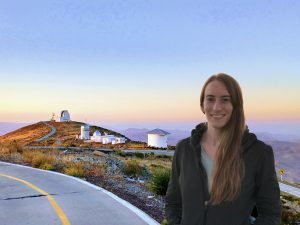 [TORONTO] University of Toronto astronomer, Maria Drout, has received a prestigious 2018 Azrieli Global Scholar Award from the Canadian Institute for Advanced Research (CIFAR). The award recognizes researchers from diverse fields in the early stages of their careers. Drout is one of 12 award winners in 2018 from Canada, the U.S., Israel, Singapore and the Netherlands. Drout’s research focuses on the lives and evolution of massive stars, as well as supernovas and other short-lived astronomical phenomena. In 2017, she and her colleagues at Carnegie Observatories made astronomical history as the first observers to identify the visual component of an event—the merger of two neutron stars—that generated gravitational waves detected on Earth. The observation was part of the first ever astronomical investigation of a phenomenon using both light and gravitational waves. Her subsequent analysis of the explosion that resulted from the merger, called a kilonova, provided evidence that most of the heavy elements in the Universe like gold and platinum were created in neutron star mergers. Drout received her PhD from Harvard University and joined the University of Toronto as a Carnegie-Dunlap Fellow in 2016. She became an Assistant Professor in U of T’s Department of Astronomy & Astrophysics on September 3rd 2018. The CIFAR Azrieli Global Scholars program is enabled by the generous support of the Azrieli Foundation, the Love Family Leadership Development Fund, and many other individuals, corporations and foundations.